Elegant 8-bit style platforming and action, but with a unique take on jumping challenges that recontextualizes the original Shovel Knight entirely. Speedy action games that emphasize acrobatics over combat in the vein of Bionic Commando, Demon’s Crest, and Rayman Legends. Price: $9.99 standalone, $24.99 included with Shovel Knight: Treasure Trove, free for current Shovel Knight owners on other platforms. Games of high quality and distinction tend to lose a little bit of their prestige once they get ported around to every device on the planet over the course of multiple years. Indie classics like Bastion or Limbo just become part of the landscape when everything from Wii U to your refrigerator display can run them; they’re still some of the best games ever made, they just become all too easy to ignore. Hence why I was ambivalent toward Shovel Knight: Specter of Torment when it was announced as an exclusive (albeit a short-lived one) for the Nintendo Switch release. Over the past three years, Yacht Club Games’ paean to NES-style run-jump-fight action has made it onto every major console, portable and operating system. Do I really need to play this game for a 100th time using one of the original’s boss characters? After playing Specter of Torment, though, I feel like a fool. Had this actually been released on the NES 25 years ago, they would have just called it Shovel Knight 2. As it is, it earns the distinction as a full sequel. While the name suggests an expansion of the original, Specter of Torment is actually a brand new campaign starring the becaped, scythe-wielding boss Specter Knight from the first game. It follows his trip gathering the whole crew of bosses on behalf of the evil Enchantress prior to the events of Shovel Knight. 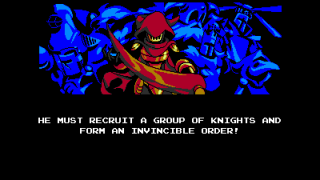 While art for each of the game’s stages and many enemy designs are borrowed from the original - not unlike how you’ll see the same enemies and platforms in multiple Super Mario Bros. and Castlevania games - the stages themselves are completely redesigned around Specter Knight’s unique mobility. Unlike Shovel Knight, who could run around and use his spade as a pogo stick, Specter Knight can briefly run up vertical walls and use his scythe as a sort of grappling hook/slingshot hybrid. So rather than jump from a moving platform to a mid-air ledge to reach a ladder as Shovel Knight, Specter Knight will have to run up a wall, back flip and then slash a lantern hanging in midair to suddenly hurl himself across the screen to the ladder. This may sound like a small change, but it effectively turns Specter of Torment into a fundamentally different game. Arenas like the Lich Knight stage, which takes the whole graveyard theme that used to be Specter Knight’s jam, force you to clear wide open chasms using scythe-slinging, and while it’s often more stressful and demanding than some of the pogoing challenge’s in Shovel Knight, it’s also far faster and exhilarating. Specter Knight himself feels less precise on the ground, a little bit more difficult to steer. Acclimating to his ability to run up walls - once you cling to a surface, he gains momentum and you temporarily can’t steer - is difficult, but reveals a delicious rhythm once you learn how it transitions to his mid-air feats. The whole milieu feels so different. Specter Knight’s home base in the Enchantress’ castle is awash in purple, black, and vivid red skulls (which you can collect and exchange for new weapons), a stark contrast to the bright primary colors of the villages Shovel Knight visits. All the ghosts and monsters he talks to there are so goofy too. Specter of Torment feels like the game Jack Skellington would make if he became obsessed with Shovel Knight instead of Christmas. Later this year, Spectre Knight will make its way to every platform Shovel Knight’s already out on. If you own the game on PS4 or Nintendo 3DS, you’ll get it as a free update which also belies its nature as a full game in its own right. For now, though, it’s one of the absolute best things you can play on Nintendo Switch, looking gorgeous on the device’s screen and feeling very playable using the Joy-con controllers. If Shovel Knight has faded into the background for you, don’t let that stymie your interest in Spectre of Torment. It’s a damn fine sequel even it isn’t called that.